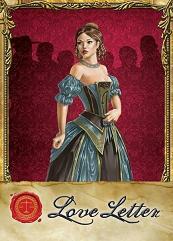 Love Letter is a game of risk, deduction, and luck for 2–4 players. Your goal is to get your love letter into Princess Annette`s hands whiledeflecting the letters from competing suitors. From a deck with only sixteen cards, each player starts with only one card in hand; one card is removed from play. On a turn, you draw one card, andplay one card, trying to expose others and knock them from the game. Powerful cards lead to early gains, but make you a target. Rely on weaker cards for too long, however, and your letter may be tossed in the fire!